[I saw this fascinating post on the social media by a Jew-wise American. What he’s saying strikes me as very possible. I think this is an area well worth digging into. 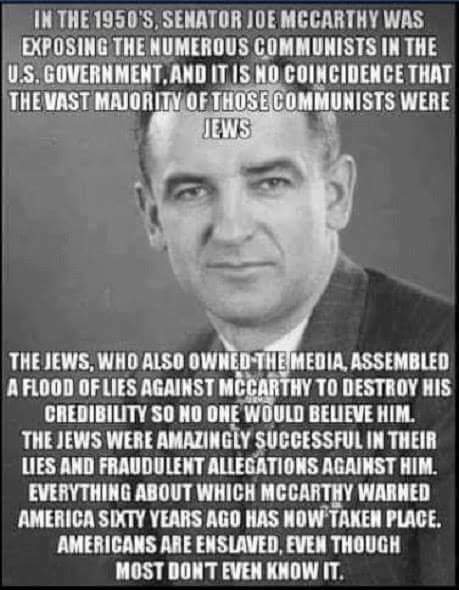 McCarthy was catching one Jewish communist after another, and Rockwell pointed out how the Jews got him destroyed – rather similar to the way the Jews got Nixon destroyed by having a Jew close to him. With regard to both Nixon and McCarthy, the Jews discredited both of them to such a degree that for decades their names were mocked and ignored. I saw that in my own lifetime with Nixon. This is how the Jews do it. They unleash a flood of hate and lies until everyone believes them, except, as usual, the Jews LIED … and those they lied about were the real victims. McCarthy was an awesome American trying to save America from communism. In the image below which is a screen shot from the social media I crossed out the name of the guy who posted it in case it gets him into trouble. But you can read what he uncovered. One of his pals is Joe Rizoli whose name I saw there. But I’m real curious about his statements. I think he’s on to something. Yet another fine white man murdered by the Jewish scum. If this is how it has gone in this century alone, then ask yourself how many fine white men have been murdered by the Jews in the last 2,000 years?? I cringe at the thought. While hunting around on the Internet I found more. It seems this guy is not alone in thinking McCarthy was poisoned. The standard narrative of Joseph McCarthy’s death is that it was due to liver complications from too much alcohol – or put more bluntly, McCarthy died of alcoholism. The truth is that McCarthy was murdered. Senator McCarthy entered Bethesda Naval Hospital April 28, 1957 for a knee injury he sustained while serving as a Marine in World War 2. He died on May 2 with the official cause of death given as “hepatitis, acute, cause unknown” of a “noninfectious type” which the slanderous Wikipedia smugly asserts, contrary to the official evidence, was due to alcoholism. Wikipedia does not have any factual data to substantiate its claim. It openly admits that it cites the telephone game as the basis of its allegations. In other words, Time magazine, a product of the Skull & Bones Henry Luce, distorted the official cause of death into “cirrhosis of the liver.” Other “journalists” who repeated the story were the arch-Zionist Drew Pearson, and biography gadfly Richard Rovere – both of whom were bitter opponents of McCarthy, a story which finally descends to the dubious Wikipedia. The myth of McCarthy’s alcoholism was concocted to provide plausible affirmability of the liver theory. Dave Martin states that close associates of McCarthy at the time of his death related that the senator could not drink because of prior hepatitis infection. Biographer M Stanton Evans also explained that although McCarthy was a social drinker, he laboriously nursed a single drink in order to maintain control of his mental faculties, recognizing that intoxication was a quick way to sink a political career. Martin shrewdly notes that since the cause of the hepatitis was unknown, he could not have been treated for anything. In other words McCarthy did not suffer any of the types A-E for which treatment would be prescribed. Martin informs us that hepatitis may result from either infection or poisoning. But we have already seen that infection could not be the cause of toxicity. Thus poisoning is the only possible source. Martin also notes that McCarthy suffered infectious hepatitis in the early 1950s, subsequent to which he may have continued his moderate social drinking – although not in the months leading to his death – which may give plausibility to drinking as the cause of death. McCarthy was reported by friends such as the Kohlbergs and the senator’s wife as being in very good health in the week prior to his death. So an explanation is required to determine his sudden reversal, and it surely was not due to his knee injury. We can affirm that McCarthy murdered on account of the US government’s refusal to obey local and national law regarding the performance of an autopsy upon McCarthy’s death. Martin relates that a friend of McCarthy, a certain Mr Engel, acting on behalf of the family, pleaded with the local, state, and national authorities to conduct an autopsy, but they unanimously refused even though required by law. Clearly the governments had something to hide. The story then is that McCarthy was admitted to Bethesda Naval Hospital on April 27 for a knee injury. Then news accounts claimed that he suffered “acute hepatitis” for which he was put into an oxygen tent from which he was removed Tuesday, improving, though still in serious condition. Then his health took a turn for the worse, whereupon he died May 2. This story doesn’t pass the smell test. Martin reports that non-infectious hepatitis has a mortality rate of only 5-10%. The most likely explanation of death is that the healthy McCarthy entered Bethesda for treatment of a knee injury, which the hospital then reported as hepatitis. “Nurse Hunnicutt” placed McCarthy in an oxygen tent, through which he was administered carbon tetrachloride, and thus murdered. It is impossible for us to believe that a man who was healthy and feeling good – who walked into the hospital for treatment of a knee injury – died within 5 days of such admission from “acute hepatitis.” His past illness of hepatitis was the plausible story that he died of it while in Bethesda. He did not drink for months prior to admission to the hospital. Of course this accusation begs to the questions of perpetrator and motive, for which we are at the ready with an explanation. Our belief is that Soviet or Mossad agents, working in conjunction with the Defense Intelligence Agency and CIA, murdered the senator. The so-called Army-McCarthy hearings were a turning point in the investigation into Soviet espionage in the United States, an event which earned the senator some powerful enemies, namely the Joint Chiefs of Staff and the entire seamy intelligence world. Another interesting speculation concerning McCarthy’s murder comes from DC Dave who argued that banksters associated with the Institute of Pacific Relations front were behind the Senator’s death. This interpretation is a variant of our own theory since, as Smedley Butler put it, he was a racketeer for the plutocrats. Wikipedia contributors. Joseph McCarthy. Wikipedia, The Free Encyclopedia. October 11, 2015, 15:15 UTC. Pic: S.Africa: Apartheid & War: What Whites did with dead Black Terrorists! Vikings arise: Swedes protest outside Parliament against Immigrant invaders – Mass Media HIDES the story!